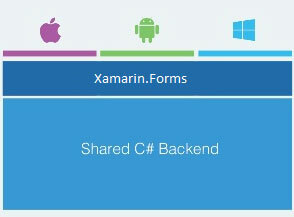 Xamarin is a unique cross-platform mobile application development platform that provides up to 75% shared code across iOS, Android and Windows. It offers Xamarin.Forms and Xamarin Native (Xamarin.Android and Xamarin.iOS) to quickly build native mobile apps across these three major platforms. It enables the use of shared C# and .Net libraries for building a common sharable backend. Xamarin.Forms offers an optional shared user interface library to build native UIs across iOS, Android and Windows phone. This shared interface is stacked on top of the common shared C# backend allowing up to 96% of shared code across platforms. It offers various built-in pages with over 40 cross-platform layouts and controls. These include gesture support, lists, labels, buttons and some other common controls. Developers can use these specific controls to share the backend code across platforms to get fully native mobile apps built completely with shared C#. Using Xamarin Forms, a cross-platform native mobile app development becomes easy with only few steps. The first step is to author the user interface using C# or XAML. Each built-in page that Xamarin Forms offers represents a single screen within a cross-platform application. Second step, at runtime, is to map these pages and their controls to platform-specific UI elements or native controls. For example, an Entry of Xamarin.Forms becomes a TextBox on Windows, EditText on Android and UITexTView on iOS. This mapping results in a real-native intuitive user interface for each platform. To create custom UIs other than pre-defined pages, developers can use Xamarin Native to take complete advantage of each platform. However, C# or XAML markup can be used for building an eye-catching and engaging UI with MVVM style and data-binding. Shared services of Xamarin Native or Xamarin.Forms can be used to impart abstraction of the platform-specific APIs and offer device-level functionality. Thus, Xamarin.Forms helps in quickly building of native mobile apps across three platforms completely in C#. For enterprises that are aiming to build cross-platform mobile apps that need less platform specific functionality, Xamarin.Forms is the ideal choice. It is suitable for app development where code sharing is of greater importance as compared to building a custom UI. Also, the development teams well-versed with XAML skills will feel right at home while using it. In order to build real-native cross-platform mobile apps, Xamarin Native are the best fit. These are suitable for app development where creation of custom UI is important rather than code sharing, and where the use of several platform-specific APIs is required. Many enterprises are deploying business and consumer apps using the Xamarin mobile app development framework. As Xamarin Forms and Xamarin Native provide the flexibility to use sharable code, many enterprises are gaining the advantage of building apps quickly and easily. A leading Fiber-optic testing equipment provider has deployed a Cross-platform Native Mobile App for the field-engineers using this game-changing framework.